There are countless biographies of King Edward VII available–some published during his lifetime–and I’ve read many of them, as well as biographies and memoirs written about and by, respectively, people in his social circle. When I discovered Jane Ridley’s newest biography, I was skeptical: what more could be said about Edward VII that I did not already know? My skepticism only slightly decreased when reading the introduction, where Ridley explained her painstaking research into the Royal Archives and the continuous array of new primary resources that cropped up (the most fascinating being the letters written to the Dowager Empress of Russia by her sister Queen Alexandra–these were in Danish and Ridley transcribed as the translator read them to her!). My skepticism crept back up again when Ridley claimed biographies misrepresented Edward VII and only referenced a few titles that fit her argument–Christopher Hibbert’s Edward VII: The Last Victorian King and Virginia Cowles’s Edward VII and His Circle (published in the US as Gay Monarch: The Life and Pleasures of Edward VII) were balanced and thorough portraits of the monarch whose influence permeated the early 20th century. Nevertheless, I can’t resist a good biography, so I decided to believe that Ridley had indeed presented the best portrait of the monarch who gave the name to my favorite era in history. 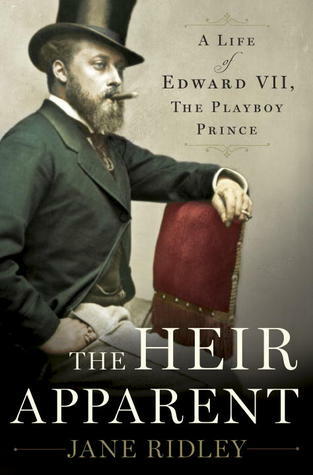 The Heir Apparent–published as Bertie: A Life of Edward VII in the UK–is an exhaustive but very lively biography that takes the reader from the days leading up to Bertie’s birth to his elaborate state funeral, which was attended by thousands of people and was one of the final gatherings of Europe’s greatest monarchs before WWI (the last gathering was at the wedding of Princess Viktoria Luise of Prussia to the Duke of Brunswick in 1913). Though Ridley travels over well-trodden stories and scandals of Bertie’s life, she skillfully weaves a full-bodied narrative that gives a 360 degree view of these events. Ridley also fills in the background to the King’s life without seeming redundant or to pad out the text, and so vivid and engaging is the writing, I usually went to sleep with the images imprinted in my mind, as though I had been watching a biographical movie. Since the King burned barrels of his correspondence and rarely expressed his inner self in the correspondence that does exist, Ridley couldn’t use his own words to illuminate any corners of his psyche, yet she still managed to make Bertie leap from the page full of his characteristic vigor. 700+ pages never flew by so quickly–I highly, highly recommend this book! I’m new to this site which I enjoy very much, thank you, What, I wonder, is the difference between “The Heir Apparent” reviewed above, and “Bertie: A Life of Edward VII” by the same author? Both books have the same cover design. It’s the same book, but given different titles to appeal to US and UK audiences (UK audiences would know who “Bertie” was). Absolutely my favourite era too, but not necessarily my favourite royal. One sentence stood out. Ridley claimed biographies misrepresented Edward VII… how? What do we think we know about King Edward that was actually not true?